The past few weeks have been hard. Many families have seen insurance rates jump to over $4000 a month. The desperation, exasperation and fear from friends and colleagues have been hard to stomach. Why? Because this is a system that was designed to keep us healthy and has morphed into one willing to bankrupt our neighbors for the sake of a higher profit margin. At the same time, there is uncertainty about who to blame and why it’s happening. Providers and patients need to realize a simple truth about insurance companies — they’re not trying to save you money. They’re not arguing with the hospital about prices. They’re not fighting to bring the cost of healthcare down. They do not want your premiums to drop, ever. They are facilitating the opposite. They are fighting to raise prices alongside big hospital systems and big pharma. Why do insurance companies want the price to go up? The short answer is– the more they pay out to providers, the more they can charge you in premiums. The federal government seriously worsened this problem in 2010. By law, insurance companies now have to pay 80-85% of every premium dollar they collect as a benefit. That means the higher the premium they charge, the more profit they make. Would you rather have 20% of $10,000 or 20% of $100,000? The more money they pay out to hospitals and pharmacies, the more they get to keep. They always want your costs to climb. Monticello Community Surgery Center in Charlottesville is committed to health care reform through transparency and advocacy. Here’s a real life example. When Monticello Community Surgery Center rolled out transparent pricing in 2013, we were excited. Our quality, outcomes and patient satisfaction ratings were well-known, consistently beating local hospitals. We were offering prices that were barely 25% of what the hospitals were charging. We naïvely thought insurance companies would love that and beat down our door. The opposite happened. None embraced it. None offered patients incentives to choose us over higher-priced, less optimal hospital options. In fact, one insurer began requiring patients to go to a local inpatient hospital for surgery or the patient would face thousands of dollars in additional co-pays, even though the surgeon was routinely operating at both locations. Imagine that – you’re trying to save the insurance company money and they penalize you with thousands in out-of-pocket costs! Insurance companies are just one piece of a very complicated puzzle. A puzzle designed to obscure what’s happening right under our noses. We are paying way, way to much for healthcare. It’s ridiculous. And we’re not getting that much in return. 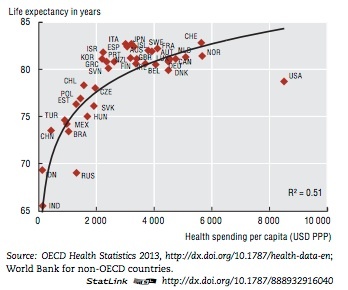 Although America’s health care costs are by far the highest in the world, our outcomes aren’t. So how can we fight this? What can consumers and patients do? We have some ideas. We want to help reveal the complicated payment system designed to confuse and steal from you. We want to explain how we think, together; we can beat it. This is part 1 of a 3 part series. If this situation is to improve, it can only happen with widespread, grassroots community involvement. We, who are paying the price, both individuals and employers, need to fight for a solution. 1. Know the Price! You absolutely have the right to know the price of your treatment as a patient. While your doctor is adept at looking at your physical health, they aren’t trained to be mindful of your financial situation. You should have a strong and trusting relationship with your physician that enables you to be upfront with them. Tell your provider that you have a high out-of-pocket expense and need to know pricing for any potential referral. Often, physician groups who practice in a large organizations make referrals within their system, even if there are other high performing providers and lower cost options. Trusted physicians will partner with you to help begin your search for better care. You would seek out this information for any other major purchase, but our healthcare system does not promote you doing so. It simply isn’t built to allow “shopping” for the best service at the lowest price. We’re trying to change that. The #ShopHealth tool at FMMA.Org lists prices at varying facilities. Traveling out of town can mean a weekend away and thousands in savings. Failure to know the price up front is often the biggest mistake patients make when seeking care. Find out the price before and research whether it is fair. Luckily, there are good tools for finding and comparing prices online. The Free Market Medical Association, a group committed to fighting against corruption in healthcare, maintains an ever growing database of cash-based, high value providers: #ShopHealth. #ShopHealth is an online tool that searches though a wide variety of available services, everything from open-heart surgery to MRIs. Guroo.com looks at millions of insurance claims to help you know the approximate range of prices that others have paid for similar services. Healthcarebluebook.com lists places and prices, by region, for dozens of elective services (CT Scan, day surgery, etc). Medibid.com works like Priceline for healthcare. They connect patients, providers and employers in a simple and transparent marketplace without networks and middlemen. Most insurance companies offer cost estimators but few use them. 2. Cost-Sharing Plans. Also called cost-sharing ministries, these are groups of people who band together to share health care costs. They are often affiliated with church groups and may require members to make pledges that they will avoid damaging health behaviors like smoking, drinking to excess, or not exercising. There are secular cost sharing plans as well. Compared to traditional insurance, the premiums are very reasonable, but the benefits tend to be much lower. Because they are not regulated as insurance plans, they are simpler; however, they tend to cover less. Most don’t pay for routine preventive services such as annual physicals, colonoscopies and routine blood tests. Cost-sharing can be regarded as similar to car insurance. Useful if your car gets wrecked, but car insurance isn’t typically expected to pay for gas, oil changes and occasional new tires. Similarly, routine lab work and colonoscopies may not be covered with cost-sharing. At our surgery center, we have positive relationships with several of these groups such as Christian Healthcare Ministries and Samaritan Ministries. We can’t say if cost-sharing plans are for right for you. Generally the patients we’ve met with these plans are happy with them. Be sure to read the fine print– they’re very different from a traditional insurance plan and may not be right for you. 3. Direct Primary Care. Direct Primary Care (DPC) is a smart way to bypass the insurance bureaucracy, save hundreds of dollars, and enjoy a more personal, useful relationship with your doctor. Rather than bill insurance, direct primary care doctors charge a monthly fee (typically $15-75, depending on your age) which allows direct access to the doctor, including unlimited visits and phone consultations. For patients that visit a doctor more than 3-4 times per year, the savings can be significant. Importantly, this allows you to develop a relationship with your doctor that’s more intimate than the care a big group can provide. Dr. Lily Hargrove of Ivy Family Medicine says her Direct Primary Care practice allows her to deliver timely and thoughtful health care in a personal, unrushed setting. There’s a lot more coming in Part 2 and Part 3, including ways to save hundreds of dollars on prescription drugs. Stay tuned!